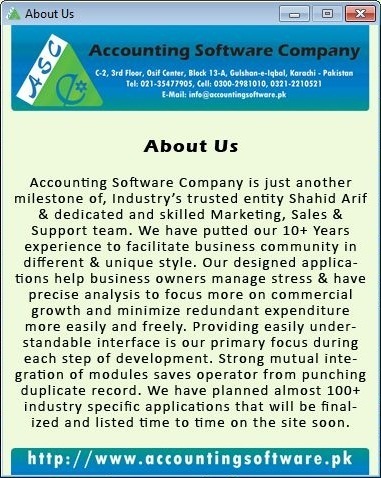 ASC English to English & Urdu Dictionary is useful dictionary software with almost all the current words. More than 37,000 English words are stored in this language translator software. You can find meaning of available English word in both English & Urdu Languages. The main purpose of creating the dictionary is to help the researchers, teachers and students who need a dictionary very frequently. This dictionary will fulfill their needs without wasting their valuable times on a paper based dictionary. English definitions in English to English Dictionary have been explained in enough detail, separated by part-of-speech. English to Urdu Dictionary in the application comes with easy understandable Urdu meanings. The dictionary is built in such a way so that anyone can use it without having any Urdu support installed in their systems. 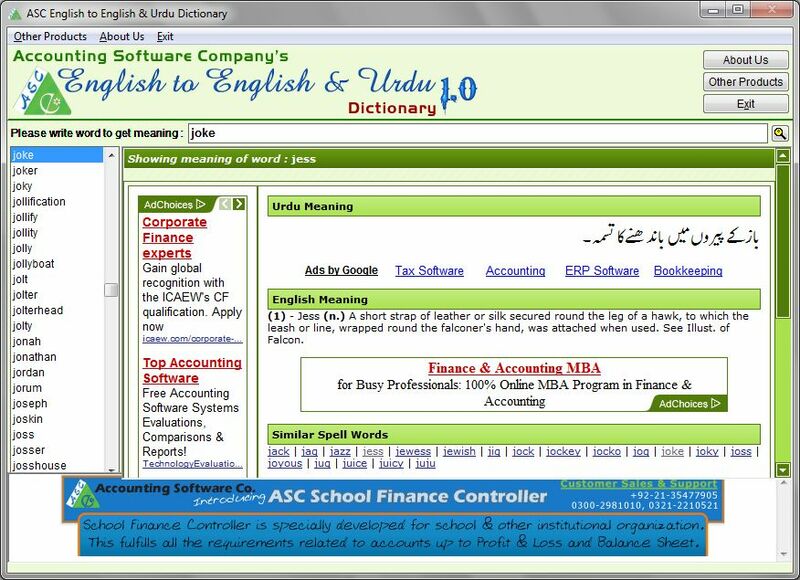 To find the Urdu & English meanings of an English word, just enter it into application’s search box, the meanings will instantly appear in front of you. Microsoft Windows 2000 / XP / 7 installed in Pentium 4 or above with minimum 512 MB RAM. 50 MB free Hard Disk Space & Internet Connection. Among all the various varieties of the dictionaries a digital dictionary is usually the most frequently-consulted category. It is mainly meant for those who have no time to wade through voluminous dictionaries and bulky encyclopedias. By using digital edition of dictionary, user can discover the meaning of the needed word in the shortest possible time with maximum satisfaction. In the modern era of speed and hurry the digital dictionary has thus assumed the shape of a wonderful tool indispensable for all those concerned with the use of language one way or the other. Cleantouch is the oldest and the most reputed name in providing English & Urdu dictionaries. After success of last 6 editions of dictionary, this seventh edition is being introduced with addition of 33,000+ new English words & its meaning. Both 70,000+ English to Urdu and 80,000+ Urdu to English meanings have been presented in a simple language and straightforward style so that even the average reader encounters no difficulty in understanding the right meanings. It's a unique dictionary based on latest Unicode technology, developed using power of Microsoft .NET platform. It has a simple and user friendly interface. It supports wildcard search & all the keyboard accessibility features of Microsoft Windows (e.g. On-Screen Keyboard & Customizing Keyboard Layout ETC). Customization section let you configure functionalities, fonts & themes. It can be installed on various Windows versions including Windows 7, Vista & XP even on low end systems. As such it is especially valuable for all those studying in institutions, working in office or living in environments where frequent switching over from English to Urdu and vise verse is a common phenomenon. By virtue of its precision and brevity this dictionary is a source of great help for all shades and grades of the general users, be businessmen and other who are confronted with a skilful manipulation of words in their daily dealings. 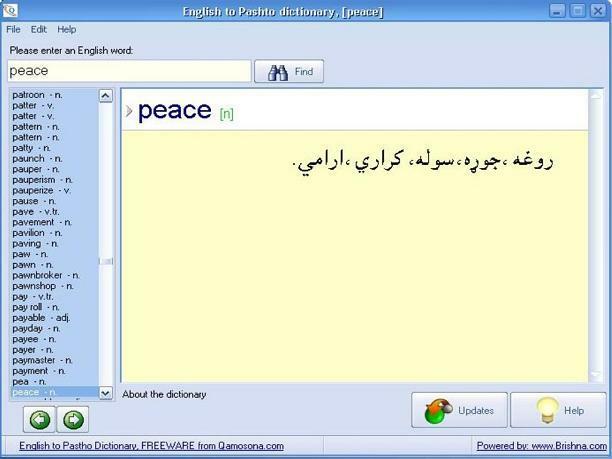 English to Pashto Dictionary is a user friendly software and a stand-alone dictionary. It has more than 22,000 English terms and has different Pashto meanings for each term. Translation is in simple Pashto.